Over the summer I have attended a course in Life Drawing here at Uppsala University, Campus Gotland. It has been incredibly useful, and the course itself is so awesome I will have to recommend it to anyone who wants to learn how to draw the human form. I have learnt a lot, much thanks to the teacher for the course, Pernilla Persson, who is an amazing artist herself. She has worked at Disney and now has a studio of her own, and her way of teaching art is really, really inspiring. The work I present to you this time is the final assignment for the course, where you were supposed to choose a piece of art - contemporary or historical, and then exaggerate/change the gesture of the pose. You had to present a gesture drawing, a structural drawing, and a rendered drawing of the pose, as well as an additional drawing showing the pose from another perspective. For this assignment, I chose the work "Sun Goddess" by Frank Frazetta, and I decided to make my own version of it, and make a "Moon Goddess" instead. 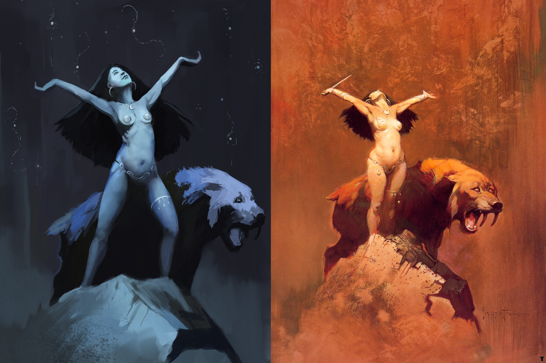 When rendering, I tried to look closely at how Frazetta himself used colour and edges, and try to translate it into an entirely different colour scheme. First, the reference artwork, Sun Goddess by Frank Frazetta. Next, the gesture and the structural drawing. 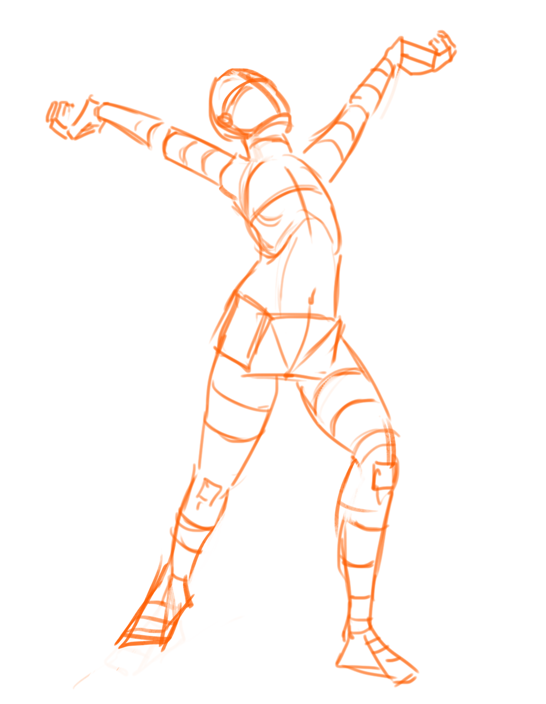 ...and finally, the rendered version of the pose! I focused primarily on the figure, leaving the beast and the fore- and background less well rendered as they were not part of the assignment. At last, there is the character from another point of view. I added the beastie as well, hrrm hrrm. Ain't he a cutie!